David Weekley Homes donated $3,500 in gift cards to Best Buy to Big Brothers Big Sisters, a nonprofit organization that provides children facing adversity with strong and enduring, professionally supported one-to-one relationships. The donation will be used to update technology, allowing the organization to better serve families and volunteers. Approximately 18 team members from David Weekley also teamed up with the MUST Ministries Summer Lunch program by donating supplies and packing sack lunches for approximately 575 less fortunate children around the Metro Atlanta area. This program provides 7,500-8,000 lunches each week day throughout the summer to children in seven counties. 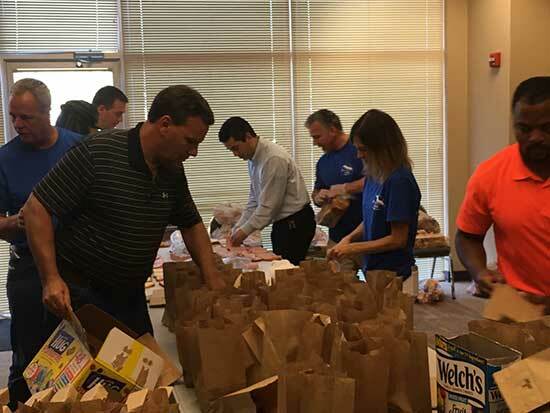 David Weekley Team Members pack lunches for the MUST Ministries Summer Lunch program. .